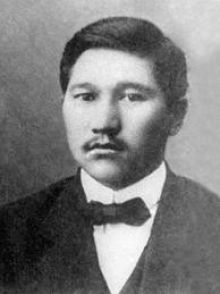 Mirjaqip Dulatuli was a Kazakh poet, writer and one of leaders of Kazakh nationalist Alash Orda government. Dulatuli was born on November 25, 1885 in the village of Sarikopa, Kostanay Province. He was from Middle jüz, Argin tribe. He lost his mother, Demesh, at the age of two and his father, Dulat, at the age of 12. He received early education in the traditional village school. In 1897, Dulatuli enrolled in a Kazakh-Russian high school and graduated in 1902 as a village teacher. In 1904, he joined Akhmet Baytursinuli and Alikhan Bokeikhanov in Karkaraly. Under the influence of these two leaders of emerging Kazakh reformist nationalist movement, he developed an anti-colonial, anti-Russian worldview. He moved to St. Petersburg in 1907 as a delegate of Kazakh Constitutional Democratic Party. In St. Petersburg, he published his first poem in the Kazakh journal "Serke", which ran only one issue. The poem was entitled Jastarga "to the Youth". He contributed another article, Bizdin Maksatimiz "Our Objective", to the second issue of the journal, which was never published. Mirjaqip's political formation was greatly maturated when he published his first poetry book, Oyan! Qazaq, "Wake up! Kazakh" in 1909. The book was immediately confiscated. He republished Oyan! Qazaq in 1911 and returned to the Turgay oblast after the publication of the book. Meanwhile, Dulatuli published his first novel Baqitsiz Jamal, "Jamal the Unfortunate" in 1910. Baqitsiz Jamal has been the first novel in the contemporary Kazakh literature. The book narrates the story of oppressed Kazakh women. Thus, in early 1910s, Dulatuli emerges as a leader of emerging Kazakh reformism and nationalist movement. His publications puts him under Russian surveillance, investigations and intimidations. Under Tsarist Russian surveillance, Dulatuli could not have a steady job or settle down in a town for a long time. He was arrested in Semey in 1911 and served one and half years prison term. After his release, Dulatuli regularly contributed to Kazakh language journals Ayqap and Qazaq until 1918 when Qazaq was closed by the Kerensky government. In his essays and poems Dulatuli criticized socio-economic, political conditions of Kazakhs under imperial administration. He also published another poetry, Azamat, "Citizen" in 1913. Dulatuli was one of the leaders of Alash Orda Government which was formed to promote Kazakh autonomy under the Menshevik government. Alash leaders, including Baytursunov and Dulatuli, aligned with the Whites, declared independence of Kazakhstan and fought against Bolsheviks between December 1917-May 1919. When the leader of the Whites, Admiral Aleksandr Kolchak, turned down requests of Alash leaders for help, the Kazakh nationalists realigned with the Bolsheviks expecting autonomy under Bolshevik government. In 1920, autonomous socialist republic was established and Alash leaders participated in local government. Dulatuli worked as an editor and teacher under Bolshevik government. In 1928, he was arrested on nationalism charges and was shot in 1935.